Well, summer has arrived and with it the usual mix of fine weather and downpours, the latter much to the disgust of our local feral cats, Pepi and Gandalf. Like all cats, they definitely prefer lounging about in the sunshine, waiting for their dinner. Whatever the weather, there is always time for more news about cats – I hope you enjoy the new issue! Cats Protection volunteers around the country have been holding Pawsome Teas – feline fun-filled afternoons with cake and other treats in aid of cats and kittens in need. If you go and look at http://www.pawsometea.org you will see there were some great sums raised, and the initiative as a whole has brought in around £40,000 so far. Deborah Good has taken over from Sue Cook as Homing Team Leader. Sue is taking time out as she is finishing her second novel – her first was published about six weeks ago under the pen name Susannah Bavin, and is called ‘The Deserter’s Daughter’. 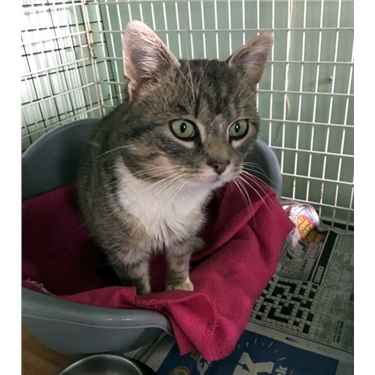 Colwyn & District Branch also recently sent out a plea for a fundraising volunteer to help Team Leader Janet Edwards raise money to help even more cats and kittens. The branch is entirely run by volunteers, and needs someone who can spare a few hours a month to help with fundraising activities. No fundraising experience is necessary, and the charity provides assistance and support materials if needed. The message has already been spread in the local press, so hopefully a helper for Janet will be forthcoming very soon. Lost and found volunteer Dorothy Dolan tells us that she’s been having an interesting time with a large ginger feral cat that was caught in May in the Ruthin area. This is him below, looking quite comically cross. Dorothy explains that as the people who reported him did not want him back, she was temporarily looking after him herself. Unfortunately, he escaped from his crate into her laundry room, which should not have been a problem as it was secure and he couldn’t (everyone assumed) get out. That was it of course, the cat had vanished… But ten days later there was a phone call asking why Cats Protection had brought him back – of course, he had brought himself the 18 miles from Abergele to where he had been, in Ruthin! The Colwyn & District Branch shop in Llandudno has a new Shop Manager, Lana Townsend. Lana has extensive experience in managing charity shops and has brought an expert touch that is already paying off. There is a revamp going on in the lshop and reports suggest it is not only looking fabulous, but is encouraging more interest, and as a result, more sales. Why not go and see the exciting new look? This newsletter will probably reach readers shortly after the show (12th August). Plans included providing games for children, information and details about fostering. Our charity shop at 50, Madoc Street, Llandudno (open 9.30am to 5pm), sells clothing bedding, books, bric-a-brac, small electricals, small items of furniture and useful household goods. Donations of such items are always welcome, as are volunteers to help in the shop. You have received this newsletter because at some time you have opted to receive communications from Cats Protection Colwyn & District Branch. However, should you wish to stop receiving this newsletter please reply to this email with UNSUBSCRIBE in the subject header.